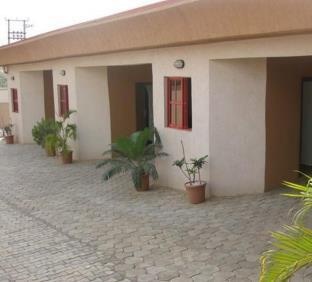 Sunview Hotel is situated in a serene environment at Akure, Ondo State. The hotel offers elegant rooms and boasts an ATM on its premises. Free WiFi is provided for all guests. All rooms are spacious, tastefully furnished and fitted with modern interior decor. Each room has an air conditioner, a flat-screen TV with satellite reception, a dining area, a work desk with a chair, floor tiles, wall paintings and an en-suite bathroom. The on-site restaurant serves a full board menu for a surcharge. A wide range of drinks is ordered at the well-stocked bar. Outdoor dining is available at the terrace. Guests enjoy swimming session at the outdoor pool and work-out session at the well-equipped fitness centre. The hotel houses a playground fitted with swings and bouncing castles. Sunview Hotel is in close proximity to Alagbaka GRA Roundabout.